3. take part in the Mass Lantern Walk (10 Sep). Visitors can expect invigorating cultural performances at the Kreta Ayer Square. This is a popular gathering point to observe the locals, and also where the Buddha Tooth Relic Temple & Museum and Chinatown Complex are situated. There’s no better place to soak in the festivities and celebration of the Mid-Autumn Festival than in Chinatown where it relives the traditional festival with aplomb. Visitors can be enthralled by the transformation of Chinatown into an enchanting garden as the streets will be decorated and lit up with a mesmerizing mix of flowers, butterflies, lights and lanterns. Today (12th Sep 2011, Monday) is the 15th day of the 8th month in the lunar calendar. Enjoy and have a great time gathering with family and friends! "Laugh At The Face of Danger"
Do you remember who Rowan Atkinson is? You might be more familiar in his role as "Mr. Bean" than in this movie as "Johnny English". Just looking at Rowan Atkinson will make you laugh out loud. Together with his funny antics in this movie, you are in for a great laugh. 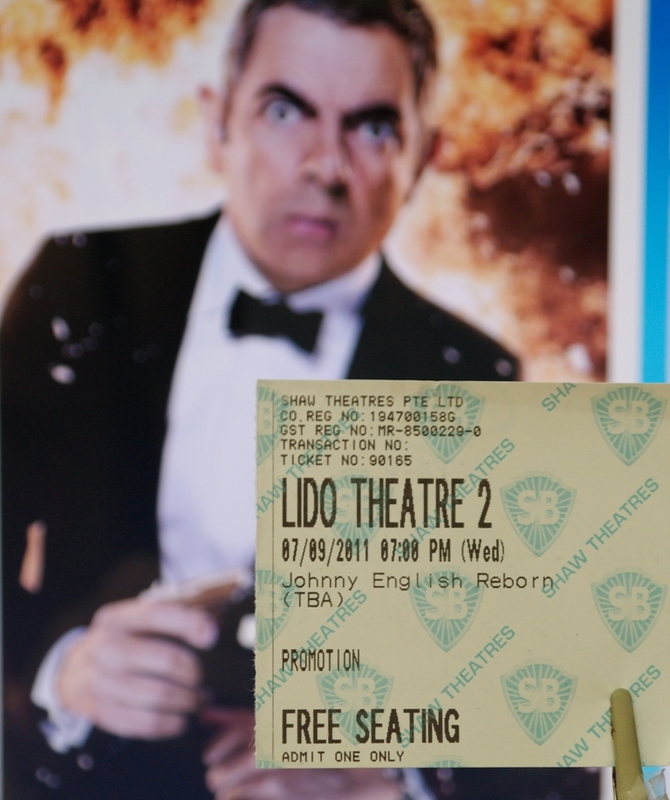 I received a pair of tickets to watch a Super Sneak Preview of Johnny English Reborn on 7th September 2011 (Wed), at Shaw Lido Cineplex (Hall 2), courtesy of United International Pictures (UIP) Singapore and omy.sg! The Chinese movie title is 《憨豆特工2》. Johnny English (Rowan Atikinson) returns to the role of the improbable secret agent in this comedy spy-thriller movie, Johnny English Reborn. He must stop a group of international assassins before they eliminate a world leader and cause global chaos. Get Ready! Johnny English is back. He is Unstoppable, Unbreakable, and totally Unsuitable. In the years since he vanished off the grid, he has been honing his unique skills in a remote region of Asia. Now that the world needs him once again, Johnny English is back in action. The world's greatest spy is back! Johnny English is an expert in martial arts, a master of disguise and an agent in total control. For Johnny English, "disaster may be an option, but failure never is." Watch this hilarious movie! And look out for the white-haired elderly Chinese lady! NTUC Income Kite Festival 2011: Kite Flying Days. - presented by ACT 3 International. when: 3 & 4 Sep 2011 (Sat and Sun), 4 - 8pm. where: The Promontory @ Marina Bay. The event is a family affair that aims to foster family bonding and celebrate the kite as a symbol of grace, cultural diversity and scientific achievements. Kite Flying Showcases @ The Lawn. Exciting kite flying demonstrations by international and local kite-masters. Traditional Kite Making Showcases @ Mist Walk. Showcasing countries from Cambodia, Indonesia, Malaysia, Philippines, Thailand and Vietnam. Balloon Art @ Mist Walk. Kite Making Workshops @ Promenade. Various workshops like Sled Kite, Kite 101, Diamond Kite, Baby Chula, Baby Wau, Visiting Masters, and Traditional Kite. Other highlights: there are international artistic and cultural performances from musicians and dancers; free goodie bags and kites, and a Food Fiesta! when: 3 - 11 Sep 2011, 4 - 10pm. where: Sentosa - Merlion Plaza, Imbiah Garden (Amphitheatre), Songs of the Sea (Forecourt) and Siloso Beach (area opposite Skyline Luge Sentosa). Buskers from the United States, Canada, Denmark, Australia, Britain, New Zealand, Chile and Japan perform at Sentosa to help raise funds for the Community Chest. - Share with us your silliest and wackiest photos with your favourite busker and stand to win $1,000 cash! The 'Most Creative' photo will win! Colour the Sentosa Buskers Festival mascot the way you want to see it. You may walk away with a Sentosa Hamper worth $200! Open to kids 12 years old and below. Submit your entry on-site at Sentosa Buskers Festival Information Booth. Which balloon should I choose? "A Dozen of Those" by Lim Shing Ee. In Lim Shing Ee’s installation, A Dozen of Those , twelve large bright red helium balloons, each being held by a faceless brown figure sitting on an equally mundane and ordinary looking brown boulder, bespeak her dilemma as a female Singapore artist living in Japan with her Japanese husband and two young sons. Struggling to balance the choices concerning her identity, loyalty, nationality and sense of belonging, the work is a metaphor for the conflicting forces that confront her which are often beyond her control. Lim's artistic practice explores mental processes of encoding and decoding fragments collected from simple everyday encounters, finding familiarity in the unfamiliar, and redefining identities through associations. Her installation works, paintings and drawings that celebrate simple objects and forms with familiar yet abstract compositions, have been referred to as the “mental maps of the mundane” - works that are deceptively familiar and simple, yet bizarrely seductive. A Dozen of Those aptly describe the sense of displacement and dislocation that all those who uproot themselves from their familiar environments must feel. Presenting to you "The Shape of a Dream" by Cake Theatrical Productions. Great performances! Thanks for all the hard work. History’s famous explorers like Cheng Ho, Vasco da Gama, Marco Polo and Ferdinand Magellan have assumed mythical proportions for their grand voyages. Heroically, they ventured across unchartered waters and into unknown territories, braving danger and uncertainty in the high seas. Stories of high adventure also surround fictional heroes like Sinbad the Sailor, who capture our imagination for their wild encounters with monsters and adventures. Alongside these figures, history is filled with stories of ordinary people from wonderfully diverse backgrounds who leave everything behind to discover new beginnings across continents and oceans. These journeys of uncertainty and peril also embody dreams of promise and future. Inspired by these historical characters and stories of adventure, The Shape of a Dream is a theatrical and imaginary tale of pilgrims on a journey of a lifetime. Explorers, emperors, pirates, sailors, prisoners and island natives, with fantastical creatures like mermaids and monsters interact in highly symbolic, dramatic, entertaining and visually engaging pockets of human and superhuman activity. The pilgrims move across vast oceans and terrains bearing curiously shaped, towering structures- symbols of the past, present and future, of hope and necessity, and of dreams taking shape. The enigmatic larger-than-life symbols they bear, morph and evolve, in turn, surprising and awesome, to capture the physical, metaphysical and spiritual dimensions that journeys kindle. Three Pilgrimages depart at different points of the Night Festival grounds. The exciting journeys lead to a final encounter, both real and surreal in a journey across all boundaries. The Cloud (Le Nuage) by SUPERBIEN is an atmospheric cloud that assumes a life of its own on a silent façade at Singapore Art Museum. SUPERBIEN is a creative agency that produces light installations and projections. I took part in the mobile photography/videography contest and got 2nd Prize: MADE BY SAM! "Precious Rubs" by Casey Chen. To create and earser from a brief that says “worthy of envy”, what can be more straightforward than having a big carat of cut Diamond. Erasers are only used when mistakes are made and careless mistakes can be very costly. This eraser reminds people that mistakes can be expensive and that sometimes the cost of an error is priceless. Who says that diamonds are forever? "The Underrated Underside of Mugs" by Edwin Low, The Design Facility. "The Underrated Underside of Mugs" serves to reposition the archetype of a mug not as a drinking vessel but as a decorative piece that is usually found resting upside down. The subtlety of the artwork on the underside of the mug provokes a second look on the usually taken for granted pose. The beauty of the underside becomes more obvious as the mug ages. "Hungry <Pig> Happy" by Bassam Jabry, Chemistry. From the outset, the designer wanted to create something dynamic and interactive, rather than simply an “object d’art”. It was a conscious choice not to deviate from the “pig” form as it is a powerful and recognisable paradigm. The design aims to bring a combination of relevance both to the inherent function of the object (saving), a cultural undertone (symbolism), and finally humour and the love for cute animals (feeding the pig until it rolls forward!). When the piggy bank is empty, it rolls back on its hind legs and looks up hungrily waiting to be fed. As it gets fed with more coins through its mouth, the weight will eventually make it roll forward, turning it from a hungry pig to a happy pig, joyously throwing its hind legs up in the air! This is also a tongue-in-cheek reflection of the joys of eating in Asia.